Mike Moore | The Journal Gazette The entrance at Northrop High School is being retrofit to accommodate a secure entry vestibule. 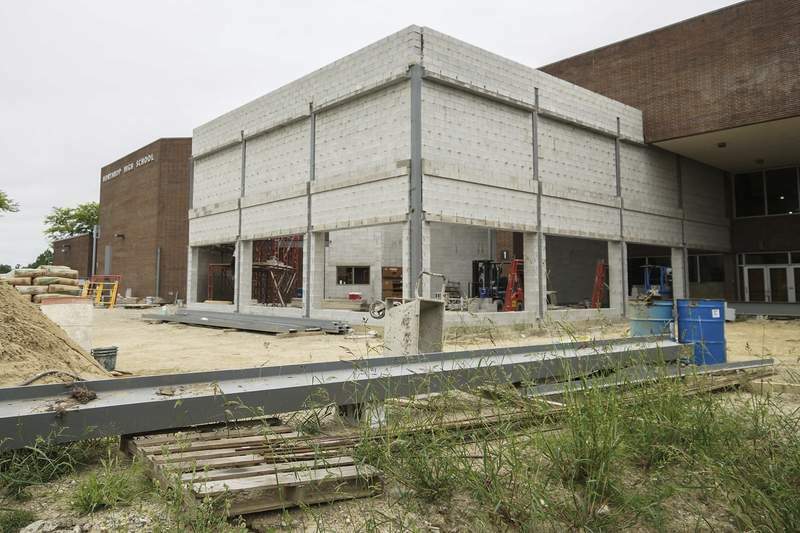 Mike Moore | The Journal Gazette Construction crews work on a secure entry vestibule at Northrop High School made possible through the successful 2016 referendum. As part of a recent Throwback Thursday, Fort Wayne Community Schools posted on social media a seemingly unremarkable, undated photograph of Blackhawk Middle School. The caption highlighted what shadows obscured: exterior doors propped open. Now Fort Wayne Community, along with other districts, controls access to schools – an effort requiring more than locked doors. 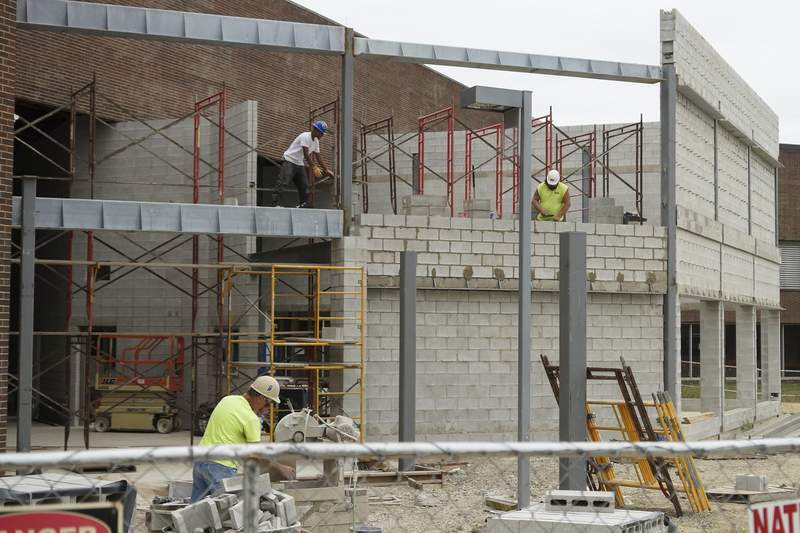 Schools throughout Allen County have undergone renovations so visitors must enter through secure vestibules, and new schools include that feature in blueprints. Controlled entrances – which typically require visitors to buzz for admittance and check in with front office staff – are just one building design feature that can enhance school safety and security, experts say. Along with planning for such possibilities as fires and severe weather, architects now question whether students and teachers have places to hide and consider ways to delay violent acts long enough for police to arrive. “School architecture has increasingly embraced school safety,” said John Miller, chief operations officer for Northwest Allen County Schools. Less than 20 years ago, Northwest Allen opened Maple Creek Middle School without a secure entrance. Four years later, in 2004, the district opened a new Carroll Middle School based on the Maple Creek floor plan, which was altered to include the security feature, Miller said. The popularity of controlling access to public schools has steadily increased since the 1999-2000 academic year, when 75 percent of schools reported using such practices as locking or monitoring doors, according to the National Center for Education Statistics. By the 2015-16 year, the most recent for which data are available, 94 percent of public schools controlled access. School shootings have influenced districts' decisions to invest in renovations. In 2005, the Whitko Community Schools board referenced the 1999 massacre in Columbine, Colorado, while discussing high school security upgrades. Those included a new main entrance so visitors would no longer enter the building through the cafeteria. Voters have supported projects strengthening security. In 2016, Fort Wayne Community got the OK to proceed with nearly $130 million in improvements, including adding secure entry vestibules at 12 schools and installing security locksets at 23 schools, enabling classroom doors to be locked from the inside with a key. In Northwest Allen, four elementary schools will get secure entrances as part of a nearly $34 million referendum approved in May. Secure entrances are upending the traditional practice of placing school offices in the middle of the building, a location convenient for students sent to the principal and for principals to support staff, said Dana Wannemacher, president of Barton-Coe-Vilamaa. The Fort Wayne firm has designed schools across Indiana, including in each Allen County public school district. Adding secure vestibules can involve swapping interior office space with classrooms along an exterior wall, Wannemacher said. It's always easier to build new, he said, but that's an option most schools can't afford. With school safety and security, people want efforts they can see, such as buzzer access, said Mike Dorn, executive director of Safe Havens International. The nonprofit campus safety organization helps schools and school systems improve crisis preparedness and campus safety. In 2014, it prepared a report for the Indiana School Safety Specialist Academy about building design features that can improve school safety and security. Recommendations, which addressed more than school shootings, included designing safer lockdown rooms; creating secondary exits in administrative offices; ensuring roofs cannot be easily accessed; funneling visitors through a secure entrance; and using natural surveillance features, such as windows. Placement of interior windows is also important because every classroom needs to be a potential hiding place, yet windowless rooms aren't ideal for supervision purposes, Wannemacher said. Windows in doors can be a solution, he said, but schools might want more visibility. Most U.S. public schools also enhance surveillance with security cameras, a sharp contrast compared to about 20 years ago, according to the 2017 Indicators of School Crime and Safety. The report was jointly produced by multiple organizations, including the National Center for Education Statistics. In the 1999-2000 school year, 19 percent of public schools used security cameras, compared with 81 percent in 2015-16, the report said. It found cameras are most prevalent at high schools (94 percent), followed by middle schools (89 percent) and elementary schools (73 percent). Other possible security measures include controlling building access with electronic controls paired with key fobs; reinforcing windows with a protective film; and, as it becomes more financially feasible, installing bullet-resistant glass, Wannemacher said. The goal is to discourage aggressors long enough for police to arrive, he said. The public is intentionally kept in the dark about how schools use such tools, he said, describing coyness as part of schools' defense. Products can strengthen protection, but Dorn, the safety expert, cautions districts from investing in safety equipment that doesn't provide other benefits or is designed to prevent only one type of attack. Potential attackers can shift their method, time and location of attack to circumvent security measures, Dorn said. “Everything you do is human-dependent,” he said. As schools ramp up security, Dorn said, it's just as important they feature bright color schemes, murals and student artwork. Safe Havens led with that advice in its report for Indiana as a way to improve school climate and culture. Security efforts can also be at odds with designs intended to foster educational strategies, such as using glass walls to create an environment for student collaboration, Wannemacher said. Miller, the Northwest Allen administrator, acknowledges striking the proper tone is among the challenges of school security. The district wants to provide a welcoming environment in which children feel safe and comfortable, not like they're learning in a prison, he said. “It's a balancing act,” Miller said.